Today, sweeping up some of the last of my unposted masks from the coastal Mayo towns, I am starting with two attractive Pascola masks by Estaban González Leva, which I bought in 1995 from INAH, a government museum shop in Mexico City. These are modern and sophisticated in style, and they lack forehead crosses. Due to the long hair, I assumed that these were Mayo masks, even though a tiny tag on the Pig declared that it was Yaqui. I know nothing more about this carver, so I can’ t even say whether they are definitely Yaqui or Mayo. I would think that these were carved for sale to dancers or collectors. Then I am adding a trio of masks by Juan Nieblas that I bought from Tom Kolaz in 2007. At that time, Juan lived in Santa Bárbara, a tiny Rio Mayo village in the Municipio of Alamos, Sonora. In contrast to the first two, these masks are more traditional in design, but brightly painted. 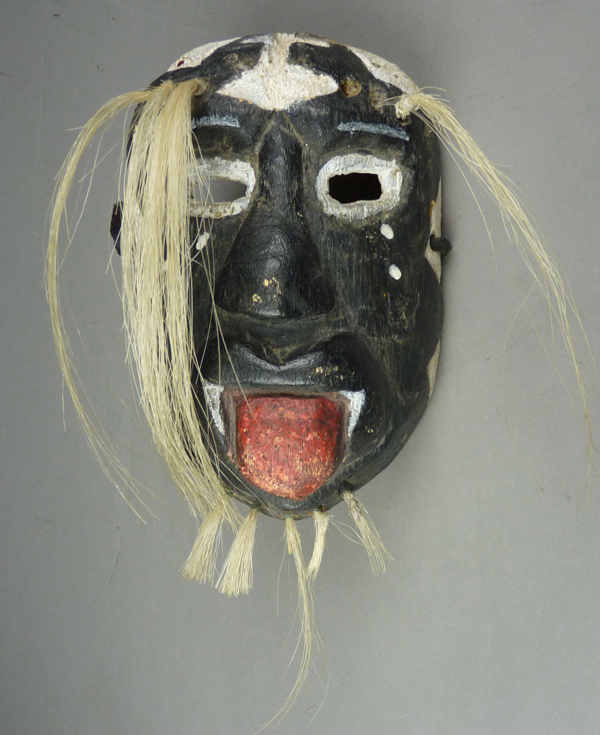 Tom purchased these three masks from the manager of a Pascola group, during a fiesta; they were to be danced, but Tom bought them before this could occur. The first of the masks by Estaban González Leva appears to have a clown’s face (or the face of an evil character in a Batman™ movie). Note the long brow hair and the extremely long beard, in the tradition of Sinaloa Mayo masks and characteristic of recent Rio Mayo masks. 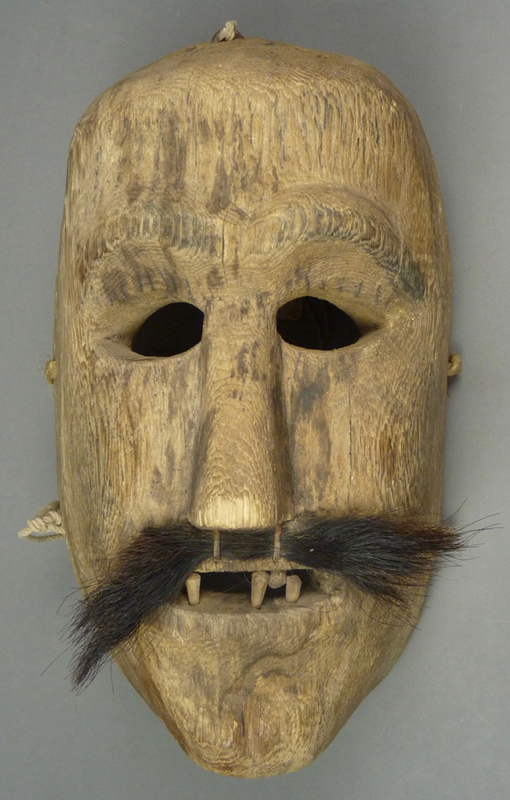 This older Mayo mask was collected by Edmond Faubert sometime in the 1970s from an undocumented location. It is traditionally carved but eccentrically painted. I have seen one other Mayo mask with such paint and that one was also found by Faubert, in the Mexican state of Sinaloa. Edmond sold this mask to a Santa Fe Indian Arts dealer in the late 70s, and it eventually came into the hands of Tom Kolaz. Recently he sold it to me. 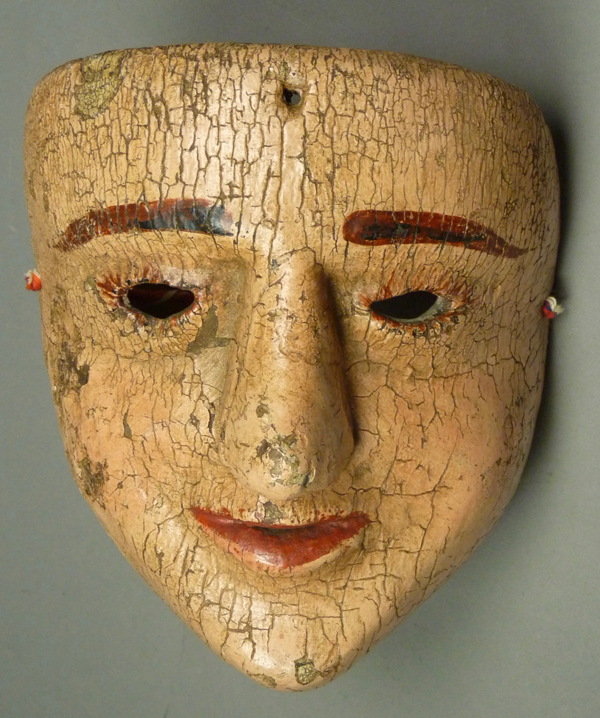 Recently I was privileged to purchase a very rare mask, a Moreno mask used in Southern Tepehuán performances. The Southern Tepehuán Indians live in scattered communities in the Mexican states of Chihuahua, Durango, and Nayarit. 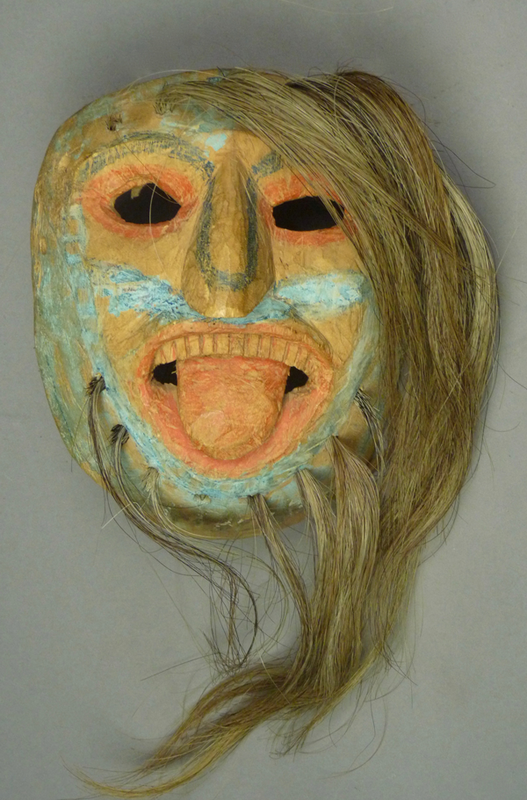 This mask was purchased by Edmond Faubert in Nayarit, probably in the early 1980s, and he subsequently sold it to a Tucson Collector in 1984. As it happens, I had photographed it in that collection in the 1990s. It later passed through the hands of several other owners; most recently Tom Kolaz acquired it in a trade and sold it to me. These Tepehuán Moreno masks are so rare that they have seldom appeared in reference books about Mexican Masks. In Máscaras Mexicanas: Simbolismos Velados, which was the catalogue for a mask exhibit held in Mexico City in 2015 (INAH, ed. Sofía Martínez del Campo Lanz, page 238), there is a very similar mask, described as a “Moreno” from the Tepehuán del Sur (Southern Tepehuán) culture. It had been used in the Danza de los Morenos in San Francisco de Ocotán, Mezquital, Durango, and was believed to date from the 19th century. Broken, patched together, and worn, it is in the collection of the Comisíon Nacional para el Desarrollo de los Pueblos Indigenas in the Ciudad de México. I have not learned much about La Danza de los Morenos. “Moreno” means a dark skinned person. Edmond Faubert told Tom Kolaz that he believed these Moreno masks were analagous to the Chapeon masks used by the Tarahumaras in the Matachines dance and that the Tepehuanes had learned this dance from their Tarahumara neighbors. In support of this, I have learned that the Tepehuanes do perform the Matachines dance in Durango. Here is the mask. The mustache, held on with metal staples, is probably made with horse tail. Last week I showed you an old mask that I recently found on Etsy™. 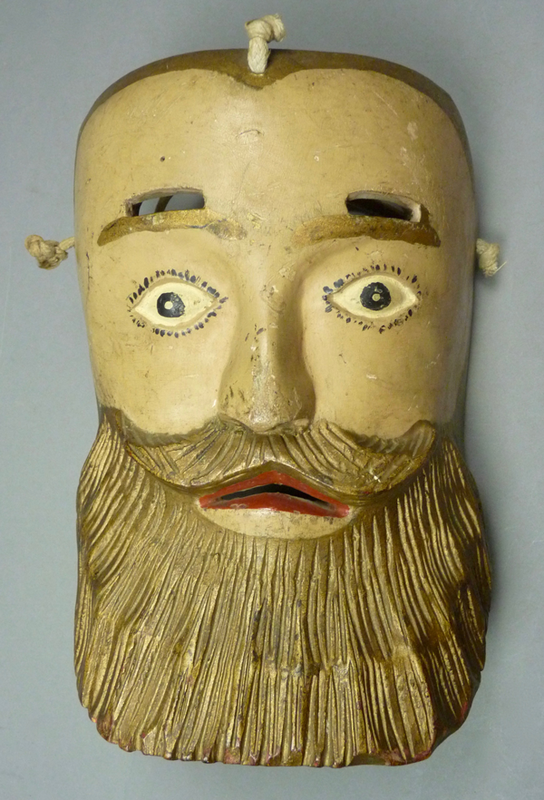 Actually I found two masks there, and today’s post will feature the second from the same dealer. This one is essentially a duplicate of an unusual female mask that I included last year in my post of May 21, 2018. They only differ in their paint or patina, but since they are so old and rare, it gives me great pleasure to look at them side by side. And here, to refresh your memory, are the three masks featured in that post, all from the Danza de los Negros in towns within or near the Municipio of Chichiquila, Puebla. This dance. “Los Negros,” is a local variation of La Danza de los Santiagueros, itself an offshoot of the Moros y Cristianos Dance that was imported from Spain by the Conquistadors. 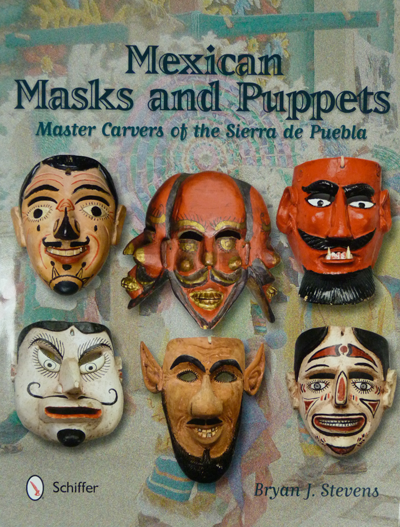 As I have explained at length in my book—Masks and Puppets: Master Carvers of the Sierra de Puebla—the Santiagueros Dance is fascinating because it pretends to depict conflict between Christians and the Pilatos, the enemies of Christ, when it seems to covertly function as a prayer for the “true Christians (the Indians of the Americas) to defeat the Spanish conquerors, who are accused of being false Christians. Such a hidden script is usually hinted at by some inconsistency, and we will find such evidence in this Negros dance. The first mask was worn by Santiago or a Santiaguero. I am including the back views of all these masks to remind you that the backs are nearly identical to one another in design. This suggests that all four of today’s masks were carved by the same carver. Recently I purchased this old mask from the “HowOriginalStore” of Austin Texas, an Etsy™ vendor. An old tag on the mask simply stated that it was from the Mexican State of Puebla. To my eye it looked very similar to a mask in a special issue of the journal Masterkey—Mexican Masks From the Southwest Museum Collection (Volume 62, Numbers 2 & 3, Summer / Fall 1988, page 23, figure 31), which was from Tuxpan in the Mexican state of Jalisco, and appeared in La Danza del Chayacate. The mask illustrated has a male face with a painted mustache and carved ears. To my eye this mask was carved by the same hand as the one in the Masterkey issue, however it has a woman’s face. During a series of posts about older Rio Mayo Pascola masks in my collection, I overlooked the one I will show you today. I bought this mask from Tom Kolaz in 2014. It had been recently collected from its elderly dancer , Don Moises of Tetanchopo, Sonora, who reported that he had been given the mask in the 1950s, and it was already 10 or 20 years old when he received it. So it might date to the 1930s or 1940s. Here it is. Over the years the relief carved lips of this mask have been painted black, which causes them to seem less impressive than they actually are. In recent posts we have examined the work of contemprary Rio Mayo carvers. I think of these artists as members of a school, a group of individuals, like the French Impressionists, each with his own style, but working within the same general framework, and perhaps influencing one another. What the Mayo artists appear to share is a new-found freedom to experiment, whereas earlier carvers may have felt more bound by tradition and less free to differentiate their individual craftsmanship from the primary task of providing a necessary product, a dance instrument. My friend Tom Kolaz has become very interested in this group of younger artists, and in recent decades he has been collecting examples of their work. I appreciate his willingness to pass some of their masks along to me. This week I will share four of these that I purchased from Tom, over the years. I obtained the first of these during a visit to Tucson in December of 2011. 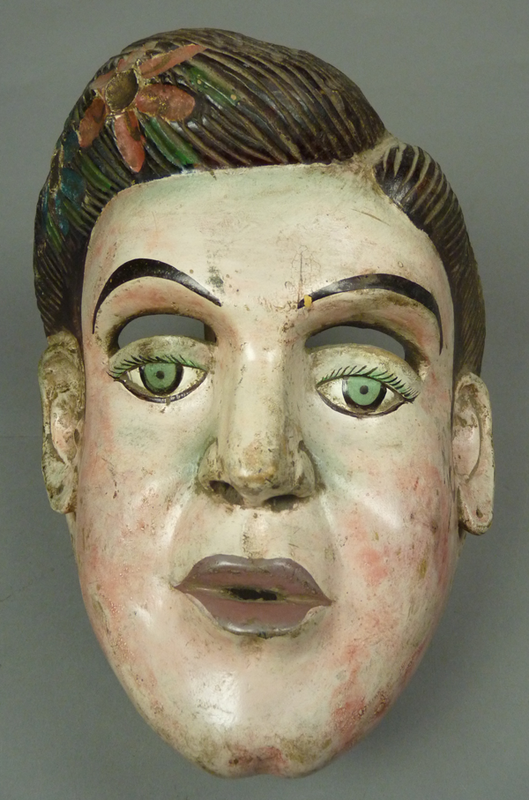 The carver is Juan Alfonso Soto López, whose nickname is “Salo.” He is a highly regarded mask maker in his community. This mask was carved in 2000, and danced for ten years. This mask has long hair in the Sinaloa style.